A: Well, Yes and No. Buddhism is not an effort to arrive at an unknown happiness but to get rid of a known unhappiness. If Nibbana is understood as an absence rather than a presence, you are right. The work consists of a scrapbook of lecture notes and retreat guide-sheets, and consequently is annoyingly repititous towards the beginning (the latter half is much better reading). In addition the terminology is, while not being contradictory in meaning, inconsistant from presentation to presentation. The idea that Nibbana is the getting rid of a known unhappiness (dukkha) and not the acquisition of an unknown happiness, and the corollary, that the method is therefore one of Not-doing and Letting Go. The fundamental idea in back of this concept is liberating, but there are two problems: 1. the term "experience" is fundamentally bound up in the idea of an experiencer. There is no way that this word can be separated from that. And 2, it is rarely, if ever, that Nibbana is defined in the positive by the Buddha. It is always in terms of "It is not This." The conceptualization of Nibbana here is a positive statement that serves well only as an illustration or simile. In the Lesser Emptiness Spell we have: "This way is empty of the disturbance emanating from the grip of sense pleasures. This way is empty of the disturbance emanating from the grip of living. This way is empty of the disturbance emanating from the grip of blindness. This way there is only this that disturbs the emptiness, that is the six sense-realms bound to this body reacting to life." and this is the meaning I understand for this idea; but we also have, at the end of the BrahmaGala Sutta: "For so long as this body shall live, gods and man shall see me; but at the break-up of the elements at the death of the body, neither Gods nor Man shall see me." And while this latter "state or condition" may be said to be "without existence" it cannot be said to be being "experienced." I don't think introspection, even your calm detached introspection, holds up under this burden. Calm, detached introspection is a tool to be used to identify that which should be let go of, the result of that is Upekkha, just the detachment. This may be a fatal flaw in your system in that your Nibbana is conditioned by this calm detached observation, and Nibbana is not conditioned. 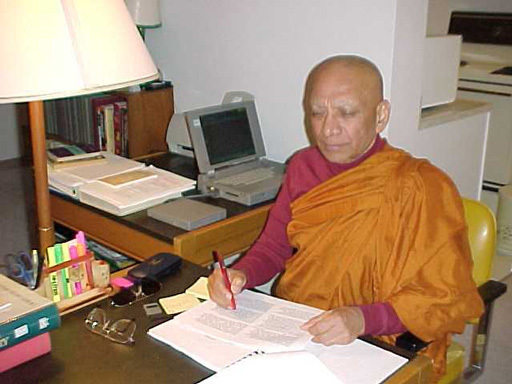 Samma sati and satipatthana as the setting up of Attention goes against BP's concept of Nibbana as a "without" thing, hence his need (and my own) to recast it, but I think that beating upa into within and making patthana into uppatthana is not a very subtle way to go about it. BP also uses sati alone for looking within (p3-14) which I question. Nibbana as Imperturbability, Experiencing Experience. Imperturbability is an attribute of Nibbana. BP uses it as a translation for Nibbana (p1-12). He derives the word from the Sanskrit where he gives the meaning: Nir=dis; vana=shake. First of all I believe Pali is older than Sanskrit, and secondly I believe the sounds in Nibbana are older than the sounds in NirVana. Ni=down; ban=bindup; na=know. But the usual translation of Nirvana in Sanskrit is Extinguish, or at a more basic level, Out of the Woods. He similarly uses Experiencing Experience in this way. The Buddha rarely, if ever defines Nibbana other than as what it is not. Since this is also fundamental to BPs system, I have a hard time understanding his inconsistency in this case. The worst aspect of this is that the word experience is impossible to divorce from the idea of an experiencer as much as BP is attempting to do this I believe it fails in a way that is damaging to his case. It is hard to balance this criticism of the use of this term with the fact that the way it is used in BP's system is unique and extraordinarily helpful in positioning one's practice. I think had the same terms and expressions been used with careful cautions in every case, it would have been more valuable.